Just found that Putting People First posted a link to a book review by Andrew Otwell. 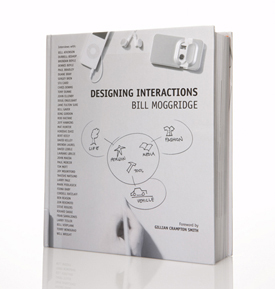 Coincidentally I just got “Designing Interactions” by Bill Moggridge a couple of days ago. I browsed through it quickly but haven’t had the time yet to read it thoroughly and properly. My first impression was very positive, it seems to be a very diverse collection of interviews with many experts from the field that the author collected and conducted in the last couple of years. A DVD with short pieces of the interviews is also provided. Ok, that I’ll do. Hopefully I will soon have the time to read the book completely. I will post my final opinion here. Thanks for the link,and I’m glad you liked the review. My first impressions were also very good, and I have to admit, I’ve been really excited about this book since I first heard about it probably more than a year ago. I do hope people will read the whole thing–it’s a beast and took me days and days to get through, and I really had to force myself through some of the lamest parts. But I would like to hear other people’s responses as well.